While more people than ever may be visiting newspaper websites, they are sticking around less this year than they were in 2007. That’s the troubling problem the Newspaper Association of America failed to mention this week, when it reported that the number of unique visitors at its members’ websites increased 12.3% to an all-time high of 199.1 million in the first three months of the year. But an analysis of the first-quarter web traffic reported by the industry association determines that, by most other key measures, the relative popularity of newspaper websites has waned in the last year in spite of the industry’s professed commitment to aggressively building online products and revenues. 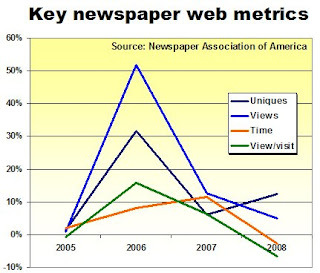 As you can see in the chart below, the growth in the key metrics of newspaper web activity grew explosively in 2006, decelerated in 2007 and slowed this year to the point that two of the four indicators actually declined. In the first three months of this year, the average amount of time visitors spent on newspaper sites fell by 2.9% to 44 minutes and 18 seconds per month, or less than 1½ minutes per day. In the same period, the average number of pages viewed per unique site visitor dropped by 6.6% to 47.2 per month. While the total number of page views rose by 4.9% to a record 9.4 billion for the first quarter of 2008, the increase was far short of the 51.9% increase achieved in 2006 and the 12.6% gain in 2007. The decline in the average duration of sessions at newspaper web pages suggests that visitors are not utilizing the industry’s sites as primary destinations, but, rather, as places to episodically view individual articles highlighted by Google News, Drudge, Digg, blogs or any of the thousands of other places they might be. If drive-by surfers continue to generate a growing proportion of newspaper traffic, will advertisers put a high enough value on these relatively fickle visitors to pay the premium rates necessary to continue funding these elaborate, content-rich websites? Although I used to enjoy some of the non-political pieces at the NT Times website, I have stopped visiting the site simply because I do not want to elevate its hit-count. I refuse to help the revenue stream of a paper that doesn't know the difference between reportage and propaganda. Sites encourage loyalty by letting visitors talk back, and talk to each other. When newspaper sites let you create a consistent identity, comment on stories, and talk to other readers, that'll be the first step in becoming destinations rather than just feed fodder for aggregators. I've been a journalist since 1994 - and I've worked online for 10 years. One thing I learned quickly, if you're model is built around the banner, it doesn't matter how many page views your have - you're model is flawed. The companies making money online are selling wares (by and large), not cyberspace. From my experience, most newspapers have no idea how to create an effective Web site. An increase in unique visitors, a decrease in time spent and a decrease in page views. I wonder if that isn't a result of better design, allowing users to absorb information more quickly from a page, and load fewer pages to get what they want. Any word on number of *visits*? My guess is that most sites are trying to increase page views -- and the word from management isn't "make the design elegant". Much information on a news site is buried in navigation that is far from flat.